20/52 Les Winan Not as good as Super Troopers but better than Club Dread. Frequently hilarious, it's just a bit too long. More Broken Lizard movies, please. 31/65 Kim Hollis Better than I ever hoped it could be. 36/159 David Mumpower I laughed. A lot. Then again, I'm a huge Broken Lizard fan. 42/68 Michael Bentley Beerfest is ridiculously stupid, but it's also quite funny in spots. Not Broken Lizard's best effort, though. We're big fans of Broken Lizard here at BOP. Super Troopers is amongst our most frequently quoted comedies, and while perhaps Club Dread didn't quite live up to the promise that the first film brought, it was still a hilarious send-up of slasher pics - and Jimmy Buffett music. Since those two movies, the guys were the primary brains behind the re-imagining of The Dukes of Hazzard, and Jay Chandrasekhar had a fair amount of involvement in the sadly cancelled television series Arrested Development. 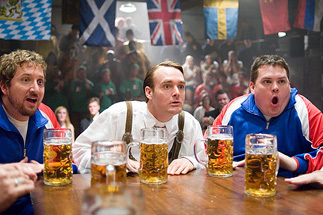 Next on the menu for the boys is an original comedy called Beerfest, where the troupe is handling both the screenplay and a majority of the major roles. The story begins when American brothers Todd and Jan Wolfhouse set out for Germany so that they can spread their grandfather's ashes at Oktoberfest. While on this journey, they discover a centuries old, ultra-secret, Olympic-style beer-drinking competition known as Beerfest. Todd and Jan try to participate, but the locals are less than hospitable. Even their cousins, the Von Wolfhausens, embarrass them and have them cast out of the event. Todd and Jan vow that they will return in a year, and that they intend to win. See the latest developments for this project on the Beerfest Movie News page.